Part of the 'poverty' proganda focuses on house size. In particular, how many children have to share a bedroom. Modern Scots are living in relative luxury compared with conditions 150 years ago. Two people were sharing every room in a home, the 1861 census shows, compared with a current average of two rooms for every person. The term 'relative' should be employed in both a contemporary and historic sense. In the developed world, we are all undoubtedly richer today then ever before. I've been intending to link to this new site and now presents the perfect opportunity. Governments come and go with ambitious reform ideas and plans. Treasury just keeps on forecasting numbers and expenditures seemingly regardless of those policy changes. The depressing thing is, if you were going to put money on who has the most reliable crystal ball, it'd have to go on Treasury. That's what history shows anyway. 101 110 114 114 109 .. .. .. .. ..
86 88 88 87 87 .. .. .. .. ..
50 58 60 60 60 .. .. .. .. ..
48 78 80 73 67 .. .. .. .. ..
Do NZ women really get such a raw deal? •Life, liberty and security of person. •Not be discriminated against for any reason including gender. •Free choice of employment, just and favourable conditions of work and protection against unemployment. •Equal pay for equal work. •A standard of living adequate for the health and wellbeing of herself and her family, including food, clothing, housing and medical care and necessary social services. •Security in the event of unemployment, sickness, disability, widowhood, old age or other lack of livelihood in circumstances beyond her control. I wonder if they would also like equal social spending? This Treasury working paper only featured the graph for males but the tables that contain the data the graph(s) are made from are available from another paper. I expected that for females the social expenditures per capita would be higher, but was surprised by how much. Over their working age lifetimes females consistently cost the state considerably more. Even at 80-84 females cost more in Super and Disability Support Services. Yet women's participation in the workforce is also lower throughout their lifetimes. The weather in Wellington has packed up so time for a bit of reading. After Colin James drew my attention to it, I thought I'd have a closer look at what the Parliamentary Health Committee published. The title of the report is long-winded: "Inquiry into improving child health outcomes and preventing child abuse with a focus on pre-conception until three years of age", November 2013, Report of the Health Committee. It's 126 pages. When I got to about page 70 it suddenly occurred to me that fathers were absent. So I did a search. "Fathers" are effectively mentioned once. There is a two paragraph section titled, "Fathers and the maternity system" and an ensuing recommendation. Apart from the acknowledgement of a submission from Great Fathers Trust (that was a waste of time), that's it. So I tried "male". Again one mention. This time relating to sterilisation. As a society we nag on about deadbeat Dads and absentee fathers. This report only demonstrates that fathers aren't particularly valued anyway. Any protective and positive role they play is virtually ignored. I'd rather end on a happy note. My Dad was probably the most influential person in my childhood and youth. Even today, when I need solace or advice or help he is often the first person I turn to. So my thoughts about fathers are coloured by my own experience. I wish it was one more commonly shared. Merry Christmas, especially to those Dads who are unwillingly separated from their children and finding this time of year hard. In our small, enlightened society many tens of thousands of children go without some necessities or nourishing food or emotional security or guidance to learn. Through the actions of mothers who eat badly and/or smoke, drink and take drugs before conception and during pregnancy and/or live with a violent man and/or then don't or can't get their children reading and counting and ready to be schooled, many of those children are in effect imprisoned, not in a hulk but in the lesser persons they become compared with what they might have been. Many are imprisoned in drugs, mental illness, delinquency and crime. Well, that's just bad parents, isn't it? None of our business. Our job is to bring up our kids right, not interfere in others' private affairs, isn't it? Isn't that individual liberty? Individual liberty requires individual responsibility. When individuals cease to act responsibly, when they neglect or abuse their child, they are no longer living in a state of individual liberty. They lost - or never achieved - that status because the collective has absolved them from taking it. That is the genesis of the conditions James' describes. Will more intervention and investment by the collective return these parents to a state of individual liberty? That seems to be the advice. The parliamentary health committee disagrees. A report in November, chaired by National MP Paul Hutchison and signed by all 10 MPs on the committee -- five National, three Labour, one Green and one New Zealand First -- focused on the needs and opportunities of the child and proposed many interventions to get parents ready and fit and get children a good start. That report, the most important parliamentary report in a long time, essentially said the country should frame policy and then make social investments on the presumption that a child of one of us is a child of all of us and that no child deserves a bad start. That is a simple economic calculation: a child who can get educated and is emotionally stable will join the workforce, pay taxes, take a full part in society and bring up children who do the same in turn. It is also a calculation of social cohesion: the more numerous the children who grow up feeling they are fully part of society, the stronger, and probably richer, that society will be. 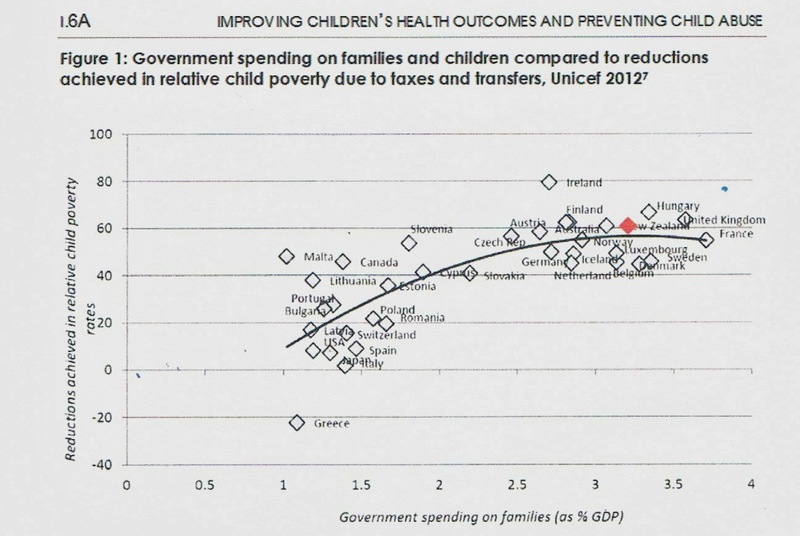 But as the Health Committee report notes NZ's spending on children is already high compared to other OECD countries. So the message sounds noble but it doesn't take me past the essential problem. You can't make people more responsible by taking responsibility off them. And in a large part, that's what the welfare state does. Social Development Minister, Paula Bennett, released a good-feel statement to end the year. 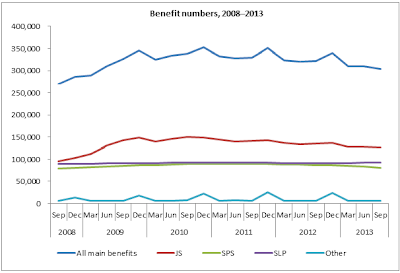 That does not however equate to overall benefit numbers dropping by the same number. 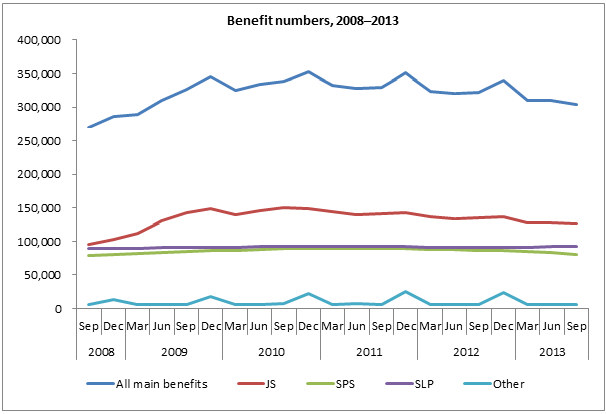 Here's the official graph for benefit numbers since National took office. On the one hand, numbers did not soar in spite of a deep (and ongoing IMO) recession. On the other, for all of the fanfare about welfare reforms, the picture doesn't offer a lot to get excited about. Every ninth New Zealander is still dependent on the state. Go into some neighbourhoods and it'll be every second or third. Earlier this year I came across an MSD fact sheet "Children's contact with MSD services". The title of the paper had been given to me in advance of its publication by someone outside of the Ministry. Periodically I had been searching the MSD website for it but nothing appeared. At some point I decided to search for it on google. To my surprise it appeared at the MSD website. (I then wrote about the flawed analysis and skewed findings here. Rodney Hide wrote about it in the NBR). What intrigued me was that the fact sheet was un-indexed and unsearchable at the MSD website. It remains so as I write. Your search - Children’s contact with MSD services - did not match any documents. No pages were found containing "Children’s contact with MSD services". The Ministry's website is updated regularly with brochures, forms, fact sheets, media releases, publications and reports. We endeavour to ensure all our information is accessible (my emphasis) and if there are any publications not available on the website that should be, we appreciate any feedback about this. "I realise it is available. My question asked why it isn't indexed. There is an important distinction. Under 'Publications and Resources' the fact sheet neither appears under 'C' nor the year of publication. Furthermore, a search of the site does not produce it. Therefore it is effectively inaccessible. Why is that the case?" With regard to your question about why the “Children’s contact with MSD services” fact sheet is not indexed on the Ministry’s website. As you will be aware, the Ministry have a number of publications and brochures across its various services and therefore it is not reasonable to index all of these on the Ministry’s website. Publications like this are available in the Publications and Resources section of the Ministry’s website and “Children’s contact with MSD services” is a searchable phrase through various website search engines. So there you go. If you just happen to hit on the right 'phrase' you will find the paper. But not if you look for it at the MSD website. It is effectively buried. MSD does not understand the difference between 'available' and 'accessible'. Or perhaps they do. I also asked for the associated spreadsheets on September 24, 2013. Do you think I've received them almost three months later? A third say YES. Good result. Probably reasonably representative. A minority of National voters didn't want the sales. Nothing to see here. Waste of time and money. Radio NZ invited me to participate in Jim Mora's panel discussion on poverty today. I would have loved to address David's Slack's lead-in comments about "intelligent redistribution" and the American experience but that would have used up too much limited time. Starts at 11:00. "The politics of empirical truths"
That counts me out, then. Having spent the last 14 years working for public policy think tanks in Australia and Britain, I have become increasingly frustrated by the 'stupidity and baseness' of politicians who refuse to acknowledge awkward empirical truths. Even when, occasionally, a politician summons up the courage to tell people facts they would rather not hear, he or she immediately comes under pressure to withdraw their comment, and even apologise for it. Rod Liddle recently offered one example in the UK edition of The Spectator. He highlighted an apology issued by the Attorney General, Dominic Grieve, who had warned of a culture of 'endemic corruption' in certain Asian countries (notably Pakistan) from which many British ethnic minorities originate. As Liddle showed, Grieve's warning was fully justified, for Pakistan is one of the most corrupt countries in the world, and the UK Electoral Commission has expressed concern about bribery and vote-buying in certain Pakistani communities in Britain. But although he was right, Grieve issued a grovelling apology. This problem of thought crime and self-censorship is not limited to issues of race and ethnicity. It extends to discussion of gender and class differences too. Last week, for example, a UKIP Member of the European Parliament, Stuart Agnew, was censured by his own party after claiming that men outnumber women in top jobs partly because many women choose child-rearing over career building. But he was right. A 2009 survey found only 12% of British mothers want to work full-time, and a 2008 report found two-thirds of working mums would still want to reduce their hours even if improved child care were made available. In Norway, where mothers can choose between free child care (if they continue working) or cash payments in lieu (if they raise their children at home), four-fifths choose to stay home. Nick Clegg, attacked Boris for his 'unpleasant, careless elitism,' Cameron hastily distanced himself from him, and the BBC and newspaper journalists declared open season on him for several days afterwards. Max Weber wouldn't have been surprised by any of this. He taught that political leadership is about charisma, the mobilisation of emotion among your followers. Evidence can be left to faceless bureaucrats. Populist leaders in search of votes work on sentiment. Peter Saunders is a Senior Fellow at The Centre for Independent Studies. The government is reportedly reconsidering its opposition to extending Paid Parental Leave from 14 to 26 weeks. This comes despite Treasury advice that there would be "minimal benefit from increasing the length of parental leave." Welfare commentator Lindsay Mitchell said last year Treasury analysed who was using paid parental leave, labour market outcomes, and child health outcomes. It found that, "...there is not a strong evidence-based argument to support extending the length of paid parent leave." Treasury's report states, "...the majority of mothers return to work when the baby is six months old...". 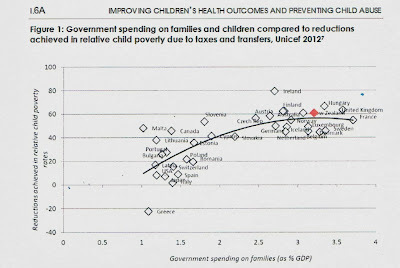 Marginal benefits to labour market participation and child health and well-being would therefore be small. Additionally, it notes, "...the most vulnerable children are likely born into families where parents are not eligible for paid parental leave...". 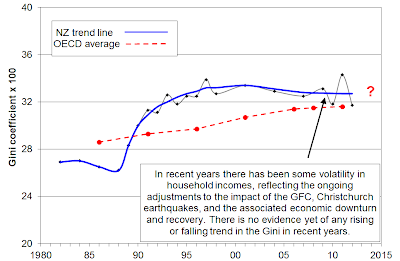 In a discussion about improving income adequacy it found that the arguments are "weak" as "the current access group are likely to be middle and high income women with stable employment." Of the 32,000 paid parental leave recipients in 2011/12, 58 percent were earning over $40,000; 27 percent were earning over $60,000. Treasury also noted a possible negative impact for employers, particularly small to medium enterprises, as their costs are, "...likely to be more significant as the length of parental leave increases." This could give rise to greater discrimination against child-bearing age females in the labour market. The implementation of 26 weeks Paid Parental Leave will cost $327 million by 2015/16. Unchanged, the cost would be $176 million in 2015/16. An annual increased expenditure of $151 million for "minimal benefit" seems highly questionable. The benefit to the government may lie in gaining electoral favour in 2014. The government now appears to be entertaining Labour MP Sue Moroney's Bill to extend Paid Parental Leave from 14 to 26 weeks. Opinion polls have shown strong support for extending paid parental leave. In a nutshell, most parents with newborns already stay off work for 6 months. They fund the difference themselves. That's because they can afford to. If Bill English approves this it's a middle-class handout. A vote-buyer. Nothing more, nothing less. Jacinda Ardern: What will her Government do to address low wage rates in New Zealand, given that 40 percent of the children living in poverty are being cared for by adults in paid work but who are still not earning enough to survive? 1/ Clearly they are surviving. 2/ Being pedantic, around 6 percent of children 'living in poverty' have parents who receive income from benefits and work. 34 percent receive incomes from work alone. But even they are getting more in tax credits etc than they are paying in tax. The government is already addressing low wage rates. 3/ This is the important point. That's because the income data is derived from a sample survey of 3,500 declaring their annual income. Some families experience a year of low income for a variety of reasons. Unemployment, fewer contracts, a new business start-up, illness, accident, relationship break-up etc. BUT they do have savings and assets to draw on. That is partly why less than half of the 265,000 children 'living in poverty' are actually experiencing hardship. Ardern's question is designed to shift attention from beneficiary families to working families. But children in working families will (generally) only experience transitory or temporary 'poverty'. They are not affected in the lifelong way that children who spend most of their childhoods in beneficiary families are. On NewstalkZB earlier this evening talking to Tim Dower about the latest Child Poverty report. "I assume extreme poverty is being able to afford Sky Sport but not Sky Movies." I didn't support the line that there is no poverty. I've seen kids in houses where they get sick because of crowding and unhealthy, unhygienic surroundings. Probably the same house has Sky. But the chronic poverty of benefit dependence exists. It's spirit and soul sapping.